"But how can Professor Challenger's story be true? These creatures have all been dead ten million years." Sherlock Holmes is certainly the best-known creation of Sir Arthur Conan Doyle. But Doyle created another formidable character in other stories, Professor George Challenger. The most widely-known Challenger story is The Lost World, the basis for this film, which pioneered stop-motion animation and astonished audiences in 1925. Young reporter Edward Malone (Lloyd Hughes) is told by his girlfriend, Gladys (Alma Bennet), that he must face danger if he wants to marry her. Charging to the newspaper office, he demands the most dangerous assignment available, which happens to be the lecture that the slightly mad Professor Challenger (Wallace Beery) is giving on a remote lost world where dinosaurs still live. Paula White (Bessie Love) is the daughter of explorer Maple White, who was marooned on the plateau. Challenger not only seeks to mount an expedition to rescue him, but to bring back proof positive to the scoffers. Malone volunteers, naturally, in exchange for an exclusive, as does big game hunter Sir John Raxton (Lewis Stone). Upon traveling to the Amazon, the party ascends the plateau to find that there are in fact still dinosaurs alive...but one destroys their only means of return to civilization! For over sixty years, this movie has been known only in truncation, cut to about 50 minutes. The balance of the film was believed lost, until a print of much of it turned up in Prague a few years ago. When I heard this news, the release of this movie in a restored form on DVD became one of my most fervent desires. Disc Producer David Shepard does not disappoint; this restoration is wonderful all the way around. What had been a choppy, discontinuous and frankly tedious story now becomes involving, amusing and fascinating. The romantic subplots, which I would ordinarily scoff at, help give motivations to the characters missing in the earlier version. Plenty of great Willis O'Brien stop-motion animation is restored, including the utterly amazing dinosaur stampede, done with foot-tall models on a 75-foot set. The performances are excellent throughout. Wallace Beery is unforgettable as the pompous, egotistical and hot-tempered Challenger. Lloyd Hughes is earnest and pleasant as the male lead and Lewis Stone gives a quiet but disappointed dignity to Raxton. Bessie Love is charming and attractive, with plenty of screen charisma. The one slight irritant is the inclusion of numerous unnecessary fear reaction shots inserted into the picture (a problem with the cut version as well). Interestingly, Alma Bennet, who is also quite good as the whimsical Gladys, got fifth billing but was completely eliminated from the cut version! What makes the film, however, are O'Brien's animated dinosaurs, and they are terrific. Even at their crudest, they have plenty of personality, such as the vicious Allosaurs that are constantly on the attack, down to the sneering Brontosaurus. This movie was a proving ground for much of the work that would go into O'Brien's animation on King Kong in 1933, but the technique is already quite amazing, even on a large RPTV. Following are significant sequences or shots added to the Image disc in comparison to the Lumivision/Slingshot DVD presentation. There are also a great many shots and scenes which run slightly longer on the Image disc which are not noted here. The occasions where the Slingshot disc is superior are noted in italics. Caution, however, to those not familiar with the film, for there are a number of spoilers in this list. 1:24 Added sequence of Sir Arthur Conan Doyle; the actual footage of him writing at his desk remains lost. This is substitute footage taken in 1927. 2:06-3:38 Ed Malone and Gladys discuss her desire for him to risk danger for her to marry him; Gladys plays with her cat. 8:00-8:35 Malone and Raxton's conversation at Zoological Hall is longer, with Malone expressing doubts and Raxton suggesting that Challenger be permitted to state his own case. 16:48-17:20 Mrs. Challenger scolds the professor for hurting the nice young man. 19:08-19:25 Malone reads Maple White's diary; an additional drawing of a brontosaurus is shown. 24:39-28:47 A large chunk of a reel is reinstated, with the graphic of the ship on a map sailing to South America, the party in Brazil and heading out. Here we see Malone actually writing stories, which he doesn't do in the shortened version. Challenger takes command. 30:00 Additional shots of the leopard watching as the canoes pass. 32:36 The Image disc repeats an identical shot of the ape man coming forward to peer down at the party, which shows up again after the episode with the spectacle bears. 36:02 The shot of the pteranadon flying to the left is more open in its framing on the Slingshot disc. 38:16 A comic relief sequence of Summerlee stopping on the bridge to examine a beetle. 42:29 Two night establishing shots, of a heron and an owl, are added. 43:35 Shots of Summerlee examining some lizards. 49:10-51:15 The party needs to find a safer camp. Malone climbs a tree, which the apeman gets into as well. Malone surveys the territory, and the apeman attacks. The Slingshot disc resumes with the apeman being shot by Raxton. 51:43 The Styracosaurus' head is cut off at the left side of the screen; apparently this sequence was taken from a sound print. 53:42 Making a new camp. 55:28-57:36 Raxton and Malone set off to search the cave. The payoff to the 'weapon' gag is provided here. A brief shot of a Triceratops mother and baby is added. 59:19 An additional shot of the Brontosaurus. 1:07:08 Establishing shot of the Brazilian Geodetic survey. 1:08:53 Additonal shot of volcano. 1:09:30-1:12:46 The dinosaur stampede! Loads of dinosaurs and nifty effects, crosscut with fire; the race to make a ladder; Malone, Challenger and Summerlee lost in the flaming jungle, etc. I can't believe this was cut from the familiar version. 1:13:42 Jocko climbing the plateau. 1:44:46 Brief additional shot of the apeman and the chimp. 1:16:33 Long shot of Paula on the ladder. 1:18:07 Additional shot of the apeman on the Slingshot disc. 1:19:44-1:21:02 Discussion of Gladys, obligations, romantic subplot. 1:22:04 It is clarified that the plan to return the Brontosaurus to civilization comes from Hibbard, not Challenger, which is what the Slingshot disc implies. 1:23:07 Challenger's address at the Zoological Hall is much longer. 1:26:45-1:28:17 The Brontosaurus' rampage is much longer, including a brief shot where it sticks its head in a window, disrupting a card game, and astonishing a drunk. 1:28:27 An establishing shot of boats on the Thames is not present on the Image disc. 1:28:58 The shot of the Brontosaurus on the bridge is slightly longer on the Slingshot disc. 1:29:08 The shot of the bridge collapse is a few frames longer on the Slingshot disc. 1:31:44 The Brontosaurus swims out to sea, gazing at a ship. This last shot fulfills a dream of mine; I'd read about this brief (four-second) sequence in Famous Monsters of Filmland when I was just a tyke, and it is an inexpressible pleasure to see it on the screen, restored at last. Image Transfer Review: The image is overall quite good. There are the expected flickers, speckles and scratches, but most of the time the picture is superior to the Lumivision/Slingshot version of the abridged film. The exceptions are mostly noted above. Occasionally, when a shot from a sound print is blown up, there is blurring and loss of detail, and the framing is often tighter on this Image disc than on the L/S disc. But when you're talking about one-of-a-kind material such as we have here, it feels absolutely ridiculous to quibble about such things. Color tinting is delicate and creative throughout; the Slingshot disc suffers from overly blue nighttime tints that obscure the picture too much. Audio Transfer Review: Two music scores are included. The first, by the Alloy Orchestra, is in DD 5.1 and includes occasional sound effects, such as dinosaur or leopard growls. These don't seem very directional. There is no noise or hiss. Range is excellent with good bass. The latter feature is particularly nice on a heavily percussive score such as that here. The other, more traditional score by Robert Israel, using a piano and selected musicians, is in Dolby Surround, but is equally good. No sound effects are present, so the silent film purist will probably prefer this track. Both are interesting and add significantly to the film, however. The presence of an option between the two is quite welcome. Extras Review: The disc features some very good extras which will please fans of the film or animation. 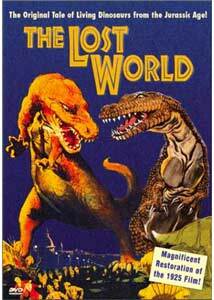 First, there is a commentary by Ray Pilot, author of The Annotated Lost World. Pilot has quite a few interesting tidbits to relate, but unfortunately his commentary has long lapses into silence that occasionally caused me to forget I was listening to a commentary. The content that is present, however, is excellent, ranging from information about Doyle and the novel, O'Brien's techniques, and the making of the film to reviews and critical reception. Over 12 minutes (not "more than 13 minutes" as the wrapper slightly exaggerates) of animation outtakes, which were discovered by Disney restoration czar Scott McQueen in Warner's stock shot vault. These are mostly alternate takes of shots which were ruined when an animator got in front of the camera during a shot. The disc thoughtfully freezes the frame where this occurs, giving us an unprecedented look at O'Brien and his assistants in action. There is also some closeup footage of the Brontosaurus eating, which doesn't appear in the surviving material on the disc. One of the niftiest extras is a small-scale reproduction of the original 1925 souvenir program, with lavish illustrations and information about the book, the movie and the stars. While greatly reduced in size, it is still pretty readable, even to one at my advanced age. Wrapping up the package are a set of photos, lobby cards and drawings from the novel's serial and book publications. It is fascinating to see how closely the visual look of the plateau is modeled on the magazine illustrations. There are extras on the Slingshot disc which also make it an essential disc to fans of the movie. Foremost is the incredible 1925 original release trailer, which is omitted from the Image disc. Also on that disc are excerpts from several animation shorts which O'Brien did for Edison some years earlier. One of them, The Dinosaur and the Missing Link, can be found in its entirety on Image's Origins of Film boxed set, however. Chaptering is adequate, and the menu screens feature the best bits of animation in full-motion. But was it necessary, really, to swipe the typeface from Spielberg's dinosaur movies? I've reviewed 225 DVDs now for this site, and this is only the second to get straight "A" grades from me. Needless to say, my very highest recommendation.